Let’s survey your house with a different lens: a magnifying glass that finds lurking fire hazards. Tag along on a guided tour as Paul Davis experts flag (by ROOM in bold text) surprising, very common risk factors. How many are hiding in your home? Our tour begins in the BASEMENT, where the first hazard appears: a missing smoke detector. Local municipalities offer specific guidelines but most require at least one unit per floor. As we stroll past the laundry area, we discover a dryer vent packed with flammable lint. Time to call a professional service to avoid sparking one of the 6,000 dryer vent fires that occur annually. The gas-fired water heater switches on with a whoosh, and we turn to see laundry resting against the appliance. We move the clothing away and go upstairs. In the KITCHEN, curtains and dish towels rest too close to the stove. As we move them aside, you vow to pay close attention while cooking because overheating food items is a significant risk factor: cooking causes one in four home fires. Are there loose nine-volt batteries in that junk drawer? Store them elsewhere because metal items simply brushing against battery contacts could start a blaze. Stepping into the FAMILY ROOM, we find an overloaded extension cord. Because electrical issues cause one in 10 home fires, let’s make a note to install another outlet immediately. The fireplace convenes frequent family gatherings, but the chimney’s flammable soot and creosote hasn’t been swept out in over a year. Next item on the to-do list: call a professional chimney sweep to schedule yearly upkeep. Opening the door to the GARAGE, we see a pile of extremely flammable sawdust leftover from a woodworking project. While sweeping it up, we net a few dust bunnies, too. These become fire hazards near outlets, electronics and sockets. And those boxes of old paper files? Very combustible fuel. Time to either toss or store offsite. Upstairs, we survey each BEDROOM. The guest room has a loose electrical outlet that needs the electrician’s attention. Your daughter’s room has a fragrant lit candle that is extremely dangerous if left unattended; a third of home fires caused by candles start in bedrooms. The master suite boasts an antique electrical appliance: that beautiful lamp is a fire hazard because its wiring isn’t up to code. A space heater warms the attached master BATHROOM but be careful: these appliances cause nearly half of home heating fires in the United States. As we step OUTSIDE for a breath of fresh air after our tour, we spy one last item for our list – the barbecue grill next to the house – and push it at least three meters from the house. 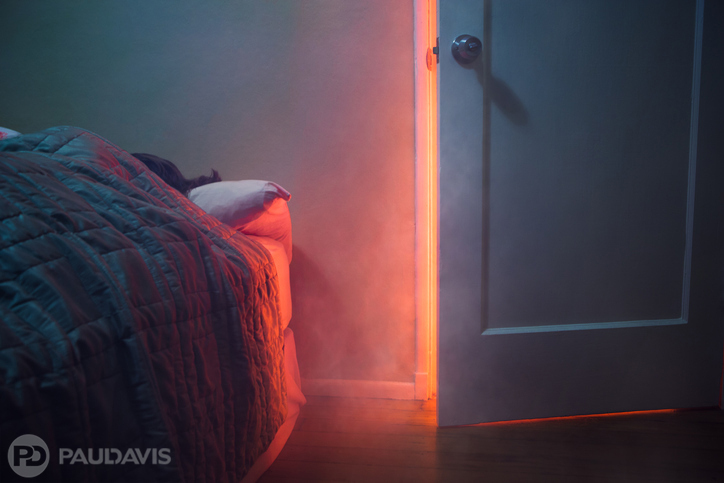 In the event of a devastating home fire, count on Paul Davis. Dedicated Paul Davis professionals – like our own Blake “PeeWee” Henson, featured in this popular Facebook show hosted by “Dirty Jobs” Mike Rowe – are there to help no matter the hour, day or need.